Anatoly Metlan eagerly explores the world, and like the Impressionist artists he admires, he portrays the light, mood, and emotions behind his journeys onto the canvas. Metlan’s scenic imagery of the Mediterranean coast transport viewers across the world to sunny and timeless locations, while his expressive portrayals of dancers skillfully capture the intensity and emotion of live performance. Anatoly Metlan was born in 1964 in Yalta, a city in southern Ukraine on the northern coast of the Black Sea. As the son of artistic parents, Metlan’s creativity was fostered at a young age. 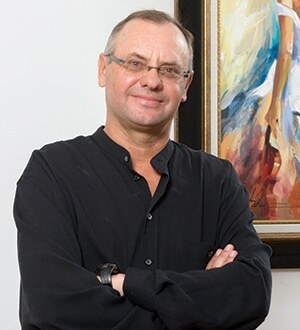 He pursued a formal education to hone his artistic skills, graduating from the local arts high school in 1985 and later attending the Krivoi Rog University in Ukraine. While in college, Metlan began exhibiting his work and soon gained recognition among members of the local art community. The Artists Guild of the Ukraine accepted him as a member in 1989. After the fall of the Soviet Union in 1991, Metlan and his family immigrated to Israel where they continue to live today. Anatoly Metlan’s travels serve as inspiration for his paintings, whether it’s the beauty of Mediterranean landscapes or talented flamenco and tango dancers in Spain. From a young age, Metlan was influenced by the Impressionists, often traveling to southern France to draw the same inspiration as these artists. Metlan enjoys traveling during the summer to Italy and France, captivated by the light and vibrant colors of seascapes and coastal villages. He infuses his landscapes with the romance and warmth he experiences on his journeys, transporting viewers to destinations full of shimmering blue oceans, boats lazily drifting in piers, and cozy homes. Tables in sunny, narrow streets decorated with flowers invite viewers to sit, rest, and perhaps enjoy a glass of wine. More recently, Metlan has focused on depicting dancers, musicians, and gypsies. In his paintings of dancers, Metlan emphasizes sensual tango poses, forever capturing moments of energy, emotion, and drama. Full of passion, these paintings draw upon Metlan’s memories of attending flamenco concerts in southern Europe. In describing his technique for capturing the female figure, Metlan says he begins with an image formed in his mind, then sets up a composition using a model. He begins coloring the image with a brush, followed by strokes with a palette knife to emphasize the dancer’s movements. Metlan says he often sets a painting aside before completing it so he can approach it from a different angle and mood. Metlan will make several changes to a work until he is satisfied.